Nintendo is talking about Wii U and we are here to listen. Kotaku editor-in-chief Stephen Totilo and I are sitting in the audience at Nintendo's Hardware Showcase, where they're about to announce... well, we don't really know. Nintendo's Katsuya Eguchi will be here, and that's about everything we've heard so far. Keep refreshing this post for live updates as Nintendo dishes what will hopefully be interesting details about its exciting new hardware. 6:11pm - We are watching an empty stage. It says "Wii U" everywhere. This was supposed to start at 6pm—Nintendo is running late. 6:20pm - Just got dark in here. It begins! 6:22pm - Eguchi is holding a Wii U controller. "We'd like to talk about Nintendoland and Wii U." Now he is throwing plastic ninja stars at the crowd. Totilo just caught one. Why is he throwing ninja stars at the crowd? The world may never know. 6:25pm - More talking about Nintendoland, Wii U's minigame collection. It'll be out at launch this holiday season. We're looking at video footage from the Animal Crossing minigame now—four players are walking around a grassy area, collecting pieces of candy. "This game introduces two completely separate roles"—animals collecting candy and guards chasing the animals because I guess they are worried about the animals' sugar intake. 6:27pm - Now we're looking at the Donkey Kong minigame, also part of Nintendoland. It looks crazy. Stephen's seen this, but I haven't. There are bananas and all sorts of crazy contraptions on the screen. Donkey Kong's Crash Course is "seemingly very simple, but has a lot of depth," Eguchi says. 6:32pm - So far, this has been just ten minutes of talking about a game that is on the show floor. Why are there 250 people here, you ask? I do not know. 6:38pm - We're looking at the main hub for Nintendoland. Like we saw in today's conference, it's basically a giant theme park. Lots of Mii characters bumming around, staring at stuff. Bouncy music playing. A train is circling around the plaza. Instead of cargo, it just has a question mark block. 6:40pm - You can collect coins by playing attractions, "satisfying conditions." You can turn them into statues to decorate your plaza. 6:41pm - MiiVerse, Nintendo's social hub, will be connected to Nintendoland through this plaza. 6:42pm - This actually looks neat. I don't know if it will hold my interest for very long after launch, but the theme park is pretty adorable. I want to go! 6:44pm - "I hate it when people go on message boards to complain about games they've never played." Message board system in MiiVerse will show you what games people have played. So you know how legit their complaints are. 6:45pm - System built into MiiVerse to avoid spoilers. 6:48pm - Eguchi compares the plaza to your personal town in Animal Crossing. "There's an easy system in place to make friends online." Does that mean no friend codes??? 6:50pm - Here's something new. We're seeing Mii racing in a car along tracks, much like Mario Kart (the intro sound effects to Mario Kart even played when it started). The car has to dodge tornados and other random obstacles. Seems like a new mini-game we haven't seen yet? Unclear. Totilo says it's F-Zero. It's F-Zero. 6:52pm - Moving on to Mario. We have the producer of New Super Mario Bros. U here. He takes the stage and asks if we like Mario. Crowd simultaneously shouts "yeah!" Producer says, "Me too." 6:53pm - Games they've been bringing out are called the "New Super Mario Bros. series." They're really pushing this as a brand. 6:54pm - Switching gears to MiiVerse - which Nintendo says "will change based on how you interact with it" depending what you're playing. 6:55pm - New Super Mario Bros. U will work with MiiVerse in two different ways: 1. Game will ask you how you feel about a situation, and your comments will appear on the game's world map. Comment on the screen: "OK, being a flying squirrel is WAY more fun than it should be." 6:57pm "This allows people who, even if they don't know each other, to share experiences while playing a game." 6:59pm - New mode called Boost Mode. You tap the screen and wherever you tap, a Boost Block will appear to create extra platforms. 7:00pm - "I have two daughters and there have been plenty of times where they say 'hey dad, can you help me with this game?' With New Super Mario Bros. U, we've made it so anybody can jump in and help out." 7:01pm - We're seeing the Boost Mode in action. Wow, even the music in New Super Mario Bros. U is exactly the same as all the other New Super Mario Bros. games. 7:02pm - The Boost Blocks are card-themed: hearts, spades, clubs, etc. They pop up as the person holding the tablet presses the screen and creates them. Very helpful for whoever's jumping. 7:03pm - Crowd audibly gasps as Nintendo's Bill Trinen plugs a last-minute Boost Block right above a gap. Theatrics! 7:05pm - Boost Blocks can also be used to access out-of-reach areas. These seem like they might make New Super Mario Bros. U way too easy—but then again, your friends can also screw you over. 7:06pm - Mario died. The Boost Blocks were not enough. 7:07pm - If you're playing New Super Mario Bros. U by yourself, you can play right on the gamepad. No TV necessary. 7:08pm - Time for Q&A! 7:09pm - Reporter asks if Nintendoland will ship in the same box as Wii U. Eguchi doesn't give a straight answer, but he compares it to the Wii's Wii Sports, which did ship in the same box as the Wii for the U.S. However, Wii Sports was sold separately in Japan. In other words, no answer. 7:11pm - Question: Is Nintendo's audience for Wii U the same as they had for the original Wii? 7:12pm - "Yes," Eguchi says. Wii was designed for customers aged 5-95. They're targeting the same audience for the Wii U. If you're under 5, they don't want you. 7:13pm - "There's sort of this attitude that Nintendo is targeting more casual consumers... but actually we're interested in making games for people who really love games." 7:14pm - Even among Nintendo, "a lot of us are gamers." They want to create an environment where "even third parties will feel really happy." 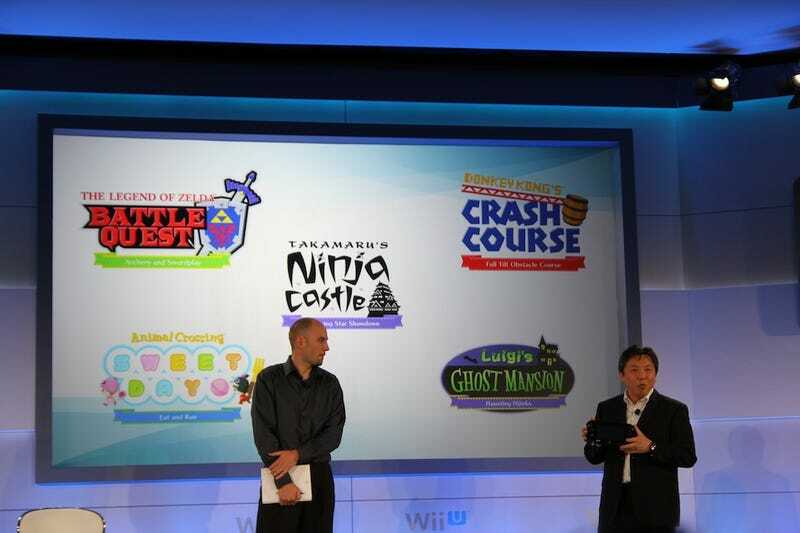 Some light bragging about the third parties that appeared in Nintendo's presser this morning. 7:17pm - "By implementing another screen, you're going to see further innovation in gameplay." 7:19pm - "What's most important is how the role of the screens is divided." 7:20pm - Eguchi says they need to strike a balance between the price of the hardware and the experience. 7:21pm - Question: Will Virtual Console saves be transferable to Wii U? 7:22pm - They're readying the system to transfer "everything you've bought." 7:23pm - Question about near-field technology (particularly in regard to games like Pokemon). Eguchi won't answer—says he wants to leave it up to our imaginations. 7:24pm - Question about the differences between the Wii U and 3DS New Super Mario Bros. games. 7:25pm - When creating a Mario game for a particular system, Nintendo tries to highlight the characteristics of that system. "I think we've had a good track record" in that regard. 7:26pm - Nintendo wants people to "fully realize" innovative elements of each system in each game. 7:27pm - Doesn't seem to be any connectivity between the Wii U and 3DS New Super Mario Bros. games. "We think each title stands by itself." 7:28pm - It's over. Not a lot of new details tonight. Nintendo promises more information on New Super Mario Bros. 2 for 3DS tomorrow at its 3DS software showcase, which will hopefully be more illuminating than this conference was. Most interesting news is that Virtual Console data is all transferable. 7:29pm - At least we got a ninja star.